My Wandering Life: Oh the drama! I actually have another family at times... it changes seasonally based on whatever show I'm working on. 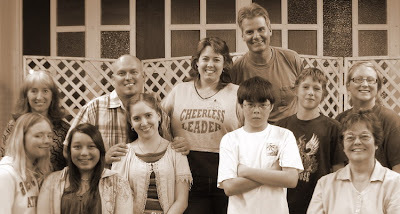 This is my current second family, the cast and two assistants of my Drama @ The Bay group. Our rehearsal space is about 108 degrees so we look very glamorous with our shiny, sweaty faces! Front row l to r: Shayne, Emily, Riley, Daniel, Darla. Back row l to r: Marian, Ron, Cassi, Eric, Zach, and me. For this show I am relishing my role as producer. It's a big hat as we are presenting it as a dinner theater so there are more than the usual loose ends to keep track of, plus a bigger budget than ever before. We have four show dates at the end of September, which is getting closer and closer! But honestly it's a blast and I love how you can work intimately with a group of people for a few months and then a few months later it's a whole different group. My kids love it because some of the cast members have kids their age and they get to hang out and play together.